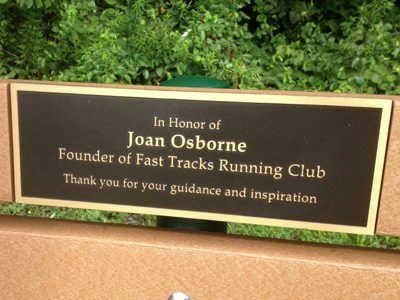 In 1992, Fast Tracks founder Joan Osborne moved from the Chicago area, where she was a member of a very active running community, to the suburbs of Philadelphia. After moving to PA, Joan and friend Ann Diaz ran together and talked about forming a women’s running club. They ran in Valley Forge Park, strategizing about how to motivate women runners or walkers to join them. “We made flyers and put them in grocery stores, libraries, in mail box areas and any other public place we could think of. I went to PTO meetings, Mom’s groups, church gatherings and anywhere I could find women gathering to invite them to come out to run or walk,” Osborne recalls. Initially, two or three women might show up for a run. Joan and Ann brought bagels and coffee and encouraged the participants to stay so they could get to know each other better. In the days before email, each person who came received a phone call thanking them for their attendance and inviting them to return with a friend or two. It was slow going until one morning Osborne read an article in the Wayne Suburban News about runners being a hazard to drivers on the curvy roads of Wayne. Osborne called the reporter and told her she should do a story about the new women’s running group in Valley Forge National Park. In the park, women could run together, and feel safe away from traffic. The newspaper ran a story about the group and gave it a much-needed publicity boost. A few months later, about fifteen women met and decided to formally establish the group as a running club. They wrote organizational rules and voted in officers. At this time, Fast Tracks was women only, which allowed women the opportunity to take leadership roles that men typically dominated. “It was important to us to be low key so new folks would not feel intimidated,” Osborne said. Men eventually joined the club but were known for a time as associates. Approximately ten years after the club formed, men were accepted as full members, and shortly after that they were voted in as board members. To this day, Fast Tracks has had only female presidents. Today, the Fast Tracks membership is made up of all kinds of talented runners, from new runners to accomplished ultra-runners and Boston Marathon streakers to trail running enthusiasts. Our members are male and female runners of all ages, speeds, interests, and abilities.